In this information architecture class for UX, participants discover the ways in which the different pages of their application or website relate to one another, and find out how to ensure information is organized in a consistent and predictable way. Learn to build an effective information architecture from multiple sources of information. Understand how to organize and sort user priorities. Find out how to ensure information is organized in a consistent and predictable way. A well-planned information architecture (IA) for websites and apps creates the foundation for a functional site or app. Discover how to create a useful information hierarchy to help users engage with your app or website. Information architecture is an often-overlooked area of website and app design, but without a well-planned information hierarchy, designers risk creating applications and sites that are confusing or make content virtually inaccessible. In this dynamic, hands-on, session, emphasis is placed on building an effective information architecture created from multiple sources of information. These sources include user research, scenarios, features, and user priorities. You can take this two-day information architecture (IA) course for UX design in our classroom with a live instructor in the same classroom with you. It is available at our classrooms in Boston, New York City, and Philadelphia. These regularly scheduled, public IA workshops include small groups of professionals from various companies. A typical live IA class involves a small group of between 6 and 10 participants, along with the instructor. 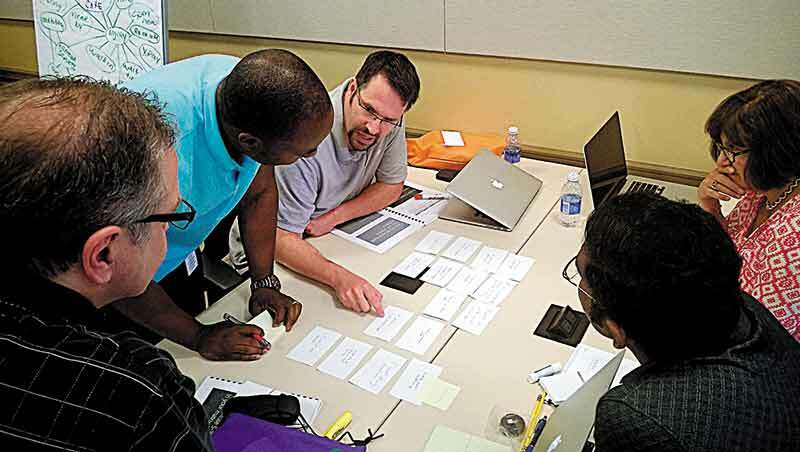 These in-person UX classes include both individual and group exercises, along with reviews of user experience / information architecture projects conducted in class. These in-person IA courses are one-day in length, and open to the public. We can also deliver this as a private UX workshop for your group or organization. This IA class is also available as part of our live, online UX training from American Graphics Institute. The online information architecture courses are conducted with a live instructor, and are also limited to a small group. You can hear and see the instructor and their presentation, talk with them, ask questions, and participate in individual projects. Both the in-person and online IA classes include the same materials, and are led by the same team of experienced faculty from American Graphics Institute. The same content is covered in both live courses, and the same instructors lead both the in-person and online IA workshops. Participants in the IA training workshop should have either completed the UX Design Principles UX course or be working in a UX or related role, such as a Business Analyst, Developer, Information Architect, or Product Management position. This information architecture training class is part of the UX Certificate Program and is also available independently several times per year as well. This IA class is one-day in length if taken in our classrooms or if taken as a live online class.